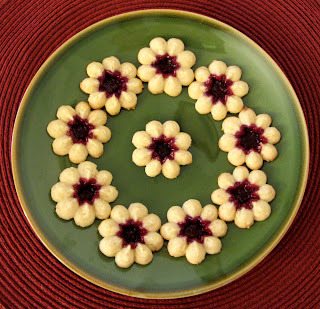 These are delicious little coconut cookies - tender, rich, and buttery - with a yummy raspberry center. To me, they look like chrysanthemums, and are just perfect for Autumn (though you could make apricot centers and call them summer daisies). In Germany, where they originated, they are called spritzgebach. They're traditional Christmas cookies. There are many different flavor variations - this coconut is just one. The cookies can be filled with any kind of jam prior to baking and can be frosted or dipped in chocolate afterwards. Whatever your preference, these cookies definitely have the yum factor! 1. Preheat the oven to 375°. Line baking sheets with parchment paper (if you are using a cookie press, do not use the paper). 2. Place the coconut in the small bowl of a food processor. Process until the coconut resembles coarse crumbs. 3. In a medium bowl, whisk together the flour and baking powder. Set aside. 4. Place the butter and sugar in the bowl of a stand mixer. Beat until light and fluffy. 5. Add the coconut, egg, and extract(s) to the butter mixture. Beat until thoroughly mixed, stopping to scrape down the sides and bottom of the bowl. 6. Add the dry ingredients to the bowl. Beat on low just until the dry ingredients are incorporated. 7. Pipe small circles of the mixture onto the baking sheets. If you are using a cookie press, do not leave the center open or the jam will stick to the baking sheets. Instead, make an indention in the center of each cookie. 8. Scoop 1/4 tsp of jam into the center of each cookie. 9. Bake for 8-10 minutes or until the edges are light golden brown. Transfer the baking sheets to racks. Let the cookies rest for 2 minutes. Transfer the cookies (on the paper, if you are using it) to racks to cool completely.